Kesennuma Fish Marketplace (気仙沼魚市場) is the one of the popular spot in Kesennuma. All the visitors can observe the inside of the market from the 2nd floor. Kesennuma is the most unloading port of Swordfish in Japan. Also, bonito is the 17 years running most unloading bonitos including year 2011. From July, the special fish start catching swordfishes, and the 1st floor will be covered with full of swordfishes. That is very powerful view. Only 2nd and 3rd floors are accessible. Don't access to the 1st floor. Most of action happens in early morning. 1. use JR BRT to Minami Kesennuma Station. Kesennuma is one of the famous port town in Tohoku, and Kesennuma Fish Marketplace is one of the greatest fish marketplace. 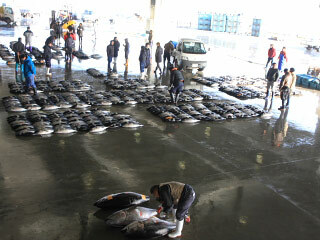 Kesennuma is very famous for unloading of swordfish and bonito. From July to end of Autumn, giant swordfishes are unloaded at this place. It is a great view to see. Kesennuma is also famous for sharks. It is fully recovered from Tusnami 2011, and see the energy of Tohoku people.